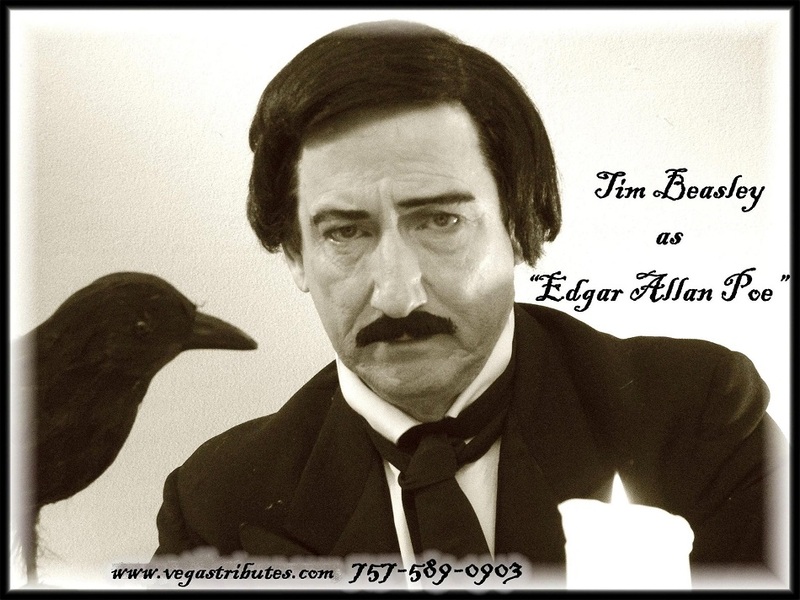 One of professional variety tribute artist Tim Beasley's favorite "Dead Legends" to perform as is Edgar Allan Poe. 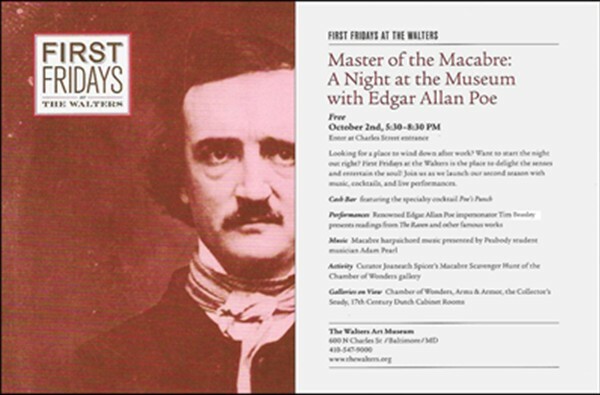 As the original "master of the macabre," Edgar Allan Poe holds a very honored place in Tim's mind. 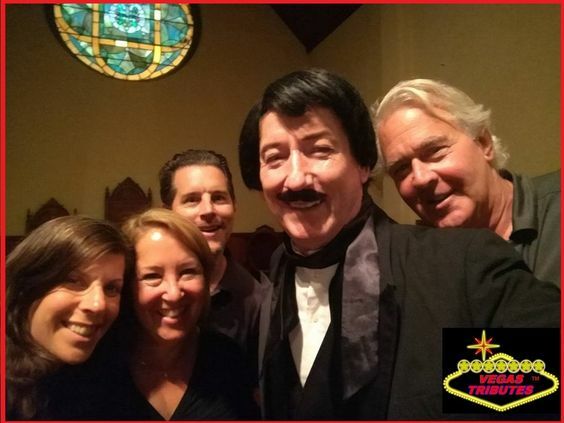 Being an accomplished multi-media and live stage actor coast to coast in a career for over 32 years, Tim is well known nationally for his supernatural knack of bringing back many deceased popular celebrities and historical figures from the “dead” in his portrayals (Mark Twain, Jim Morrison, John Lennon, Orville Wright, Teddy Roosevelt, Ronald Reagan, General Patton). 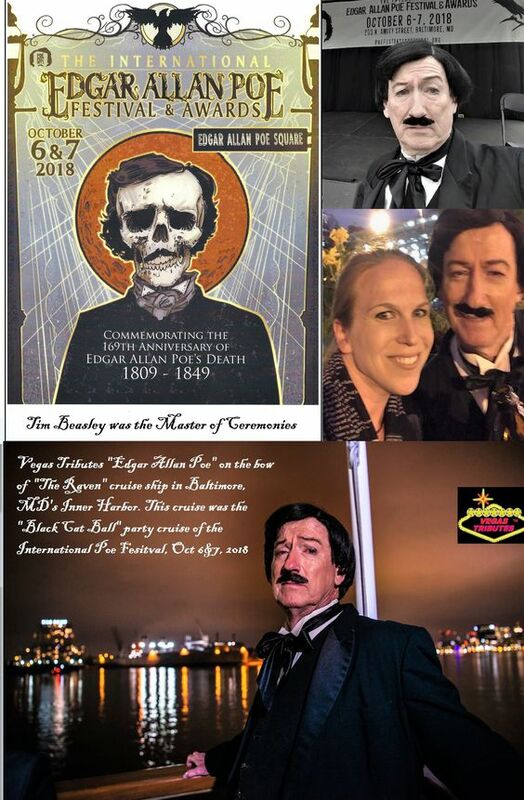 Tim’s chilling portrayal of Edgar Allan Poe is not a séance, spirit possession or channeling phenomenon, but simply his uncanny ability to pull Poe’s deceased personality, literary mind and physical likeness out of Poe's Baltimore MD tomb and back into the light of the living! 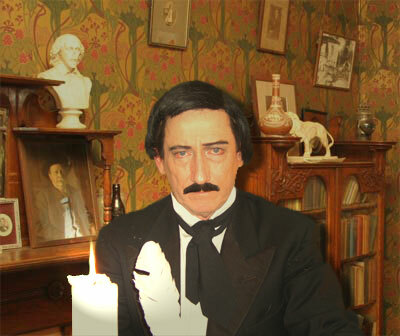 This heralded performance is a magical people-magnet and a strong entertainment attraction for any sophisticated audience as Tim will mystically conjure up Edgar Allan Poe himself, in the audiences‘ imaginations, by breathing life back into Poe’s fabulous tales of terror and other literary masterpieces. 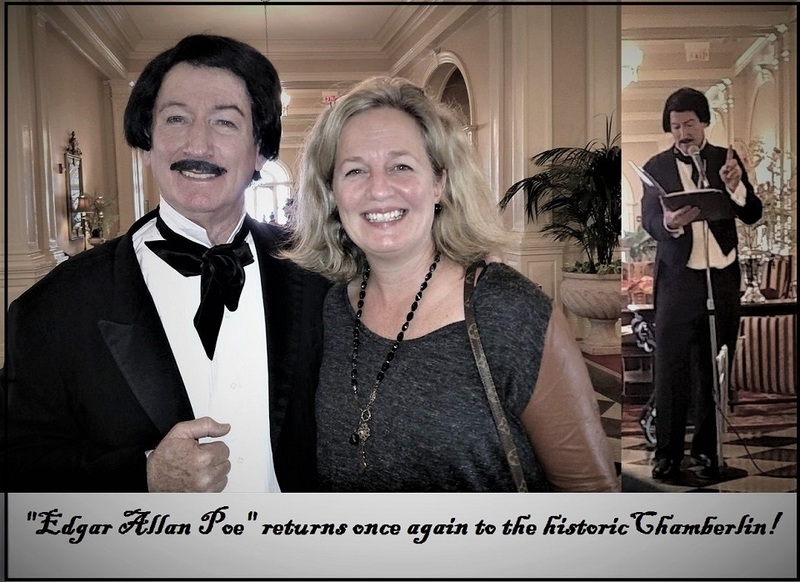 As any fan of Poe’s will tell you, it’s the haunting memory of his tales and poetry that eternally lock the reader - listener to the chains of his tormented soul. 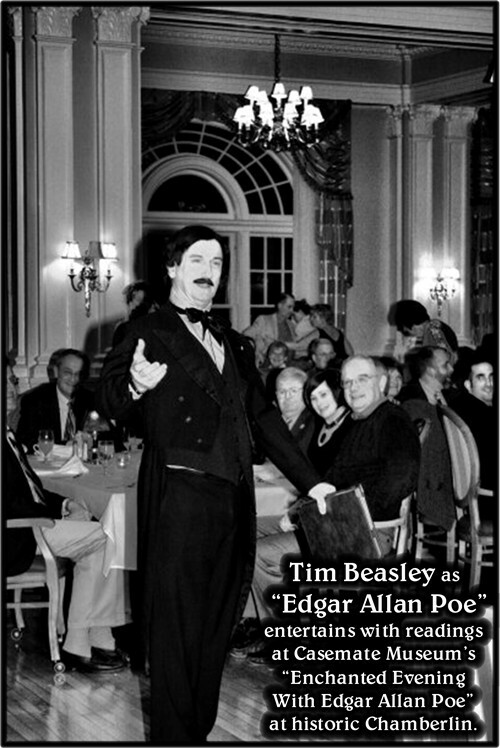 Tim Beasley will bring you and your guests an evening’s entire "Herd Of Nightmares" as he recites and reads the classic Poe to you, as Poe would have himself.....chilling and thrilling with vivid vocalization and dramatization! 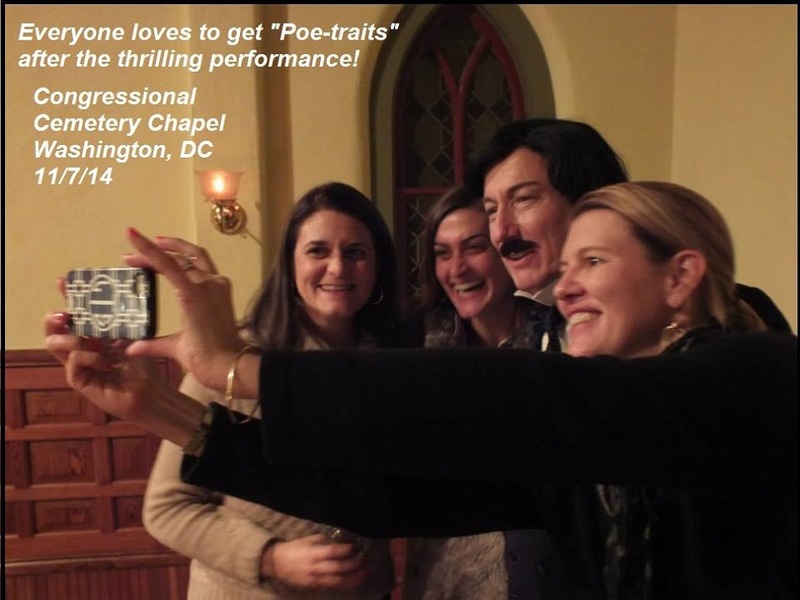 Here's a link to a YouTube video of Tim Beasley as "Edgar Allan Poe" performing an abbreviated read of "The Raven"
These are followed by a short intermission for refreshments, which is perfect for a very profitable and successful "wine" event. 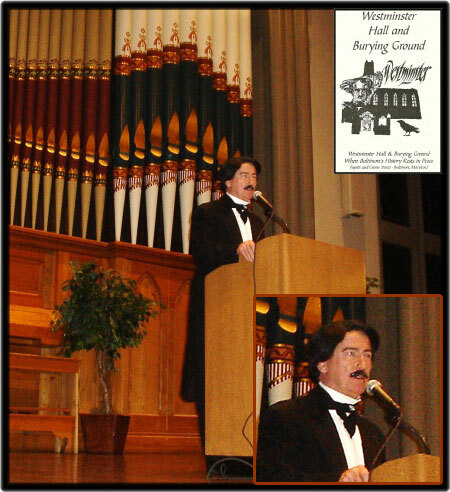 The performance resumes with a grand finale of his gothic horror stories, such as the gloriously scary and gruesome tale of murder and madness, "The Tell Tale Heart" (not for the 'weak of heart,' mind you!) 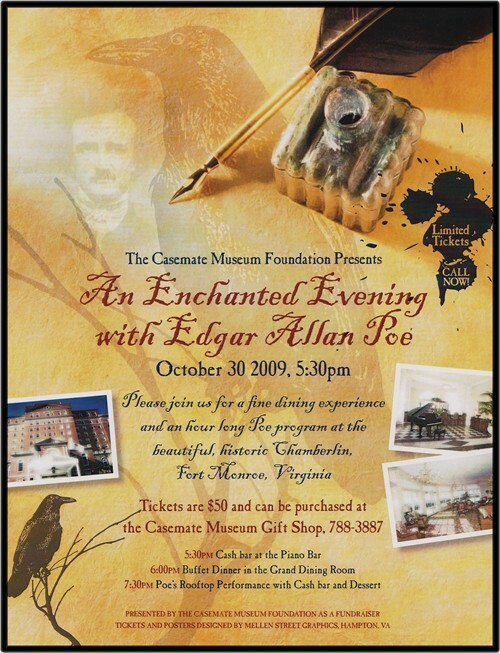 or another of his works you may prefer, such as the wonderfully terrifying "The Black Cat," "The Pit and the Pendulum," "The Premature Burial," and just perfect for wine events, "The Cask of Amontillado!" 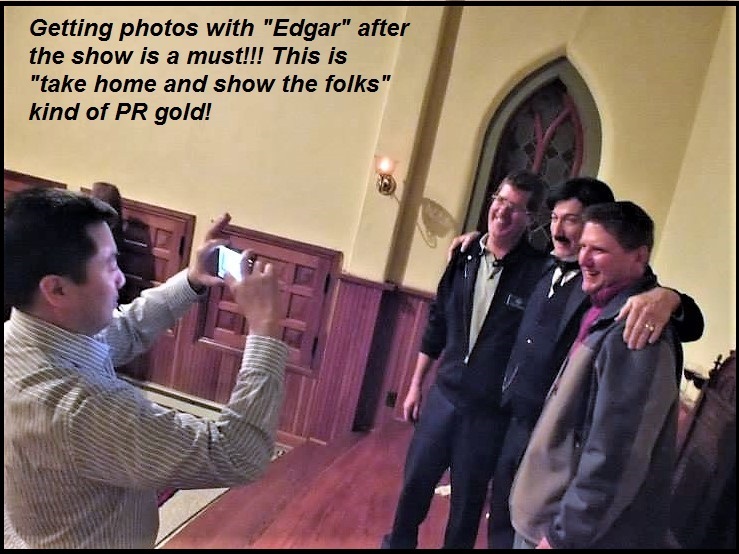 After the audience recovers with delight from the scary and shocking conclusions of the horrific classics, everyone wants to chat, have a wine toast with and get personal photos (and "paparrazzi" photos for your later promotions media!!!) 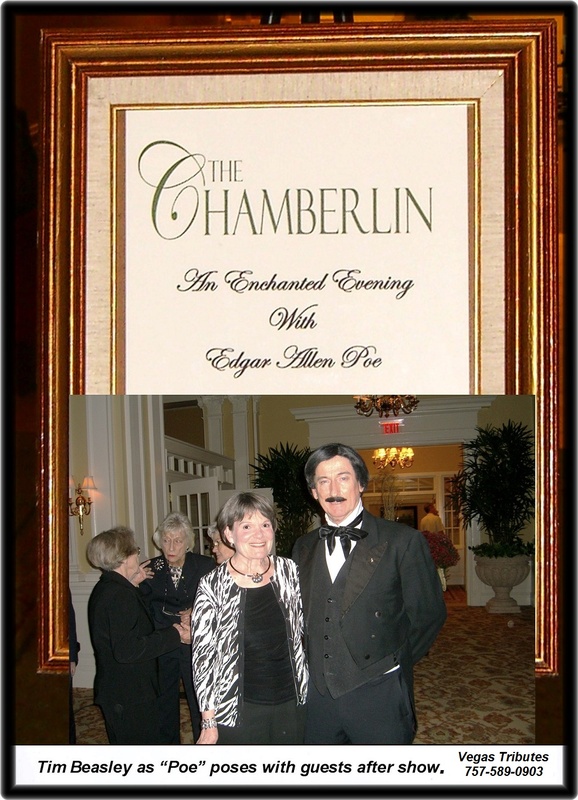 with "Mr. 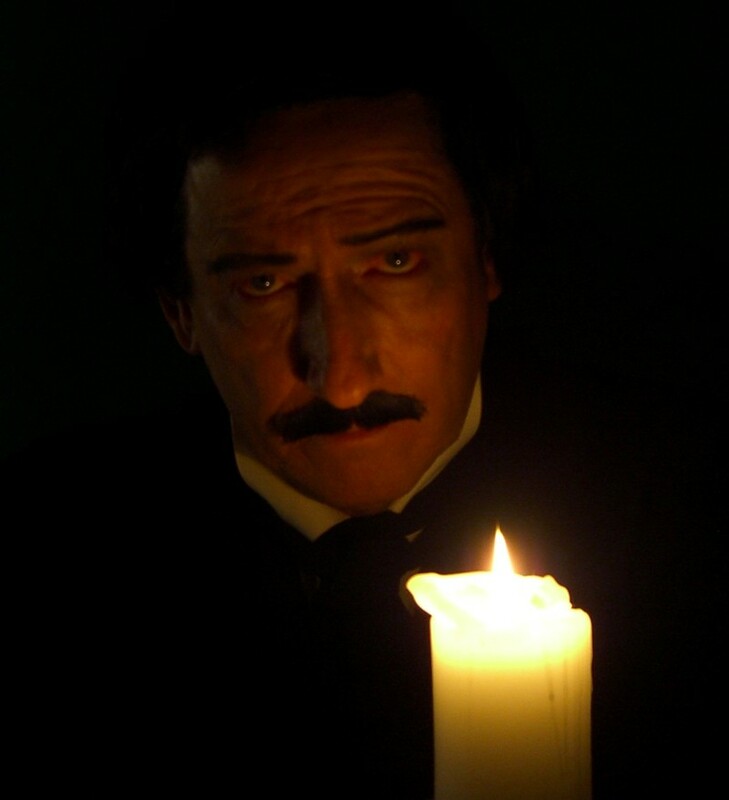 Poe!" 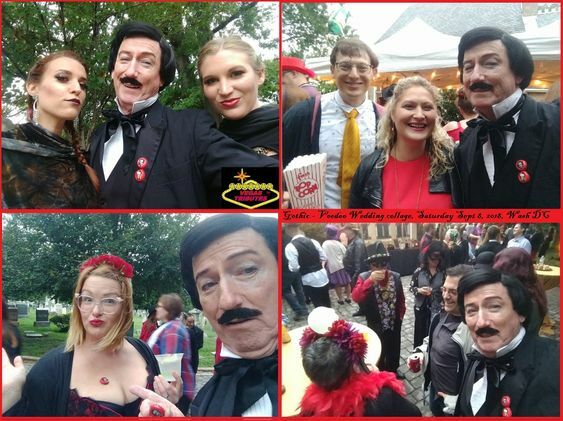 "Supernaturally" superb for any type of "Wine Social," "Special Winery Event" or "Classy Cocktail Party!" 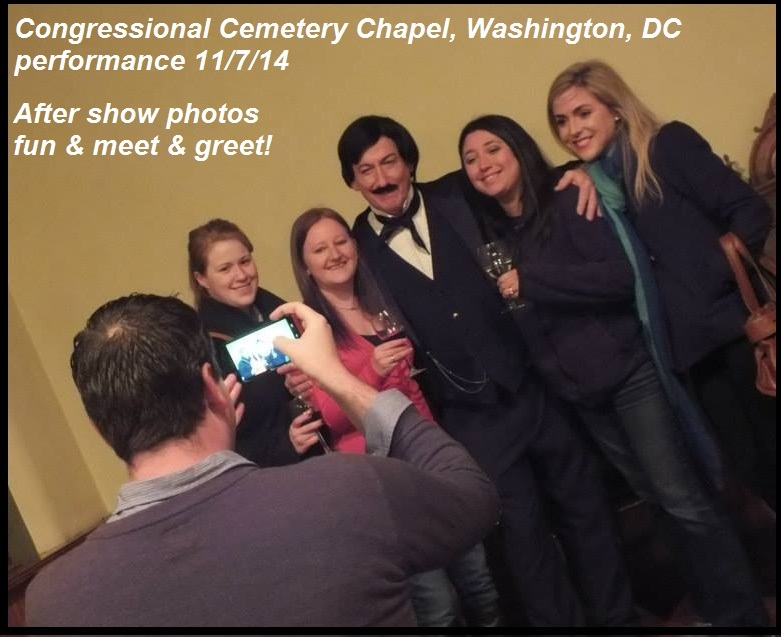 Quoth the Raven...it's Party Time!!!" 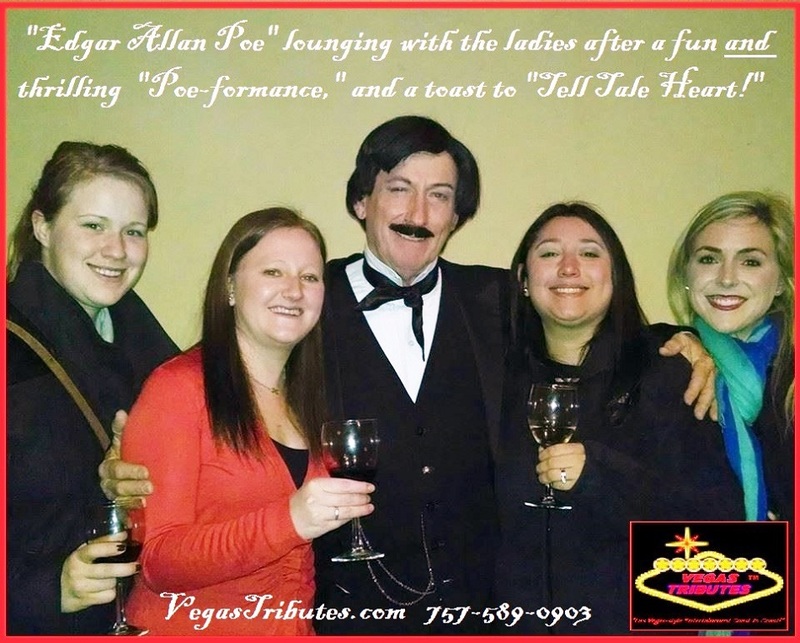 There's one thing about Edgar Allan Poe...the ladies love him!!! 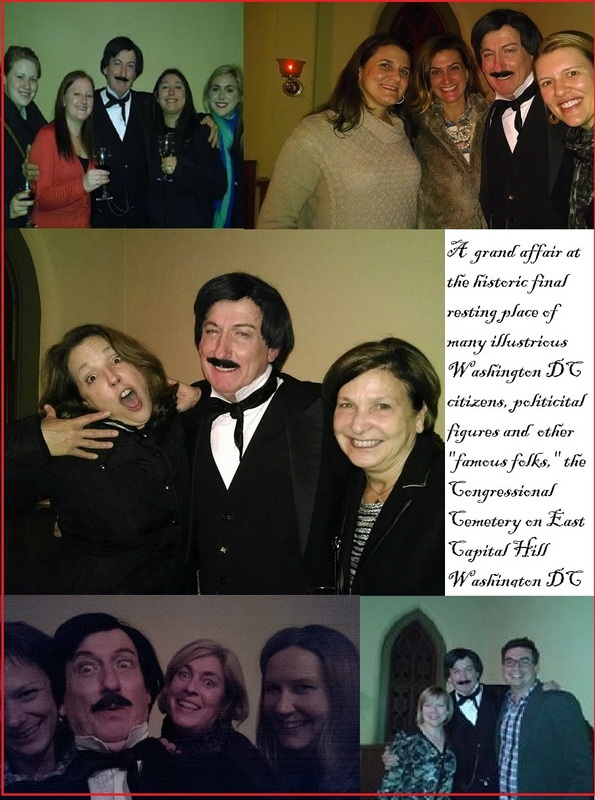 Tim is proud that he was engaged to perform "The Raven" and be co-presenter of the 2008 Private Eye Writers of America Shamus Awards banquet, held at Edgar Allan Poe's final resting place, Westminster Hall and Burying Ground, in older Baltimore, MD. 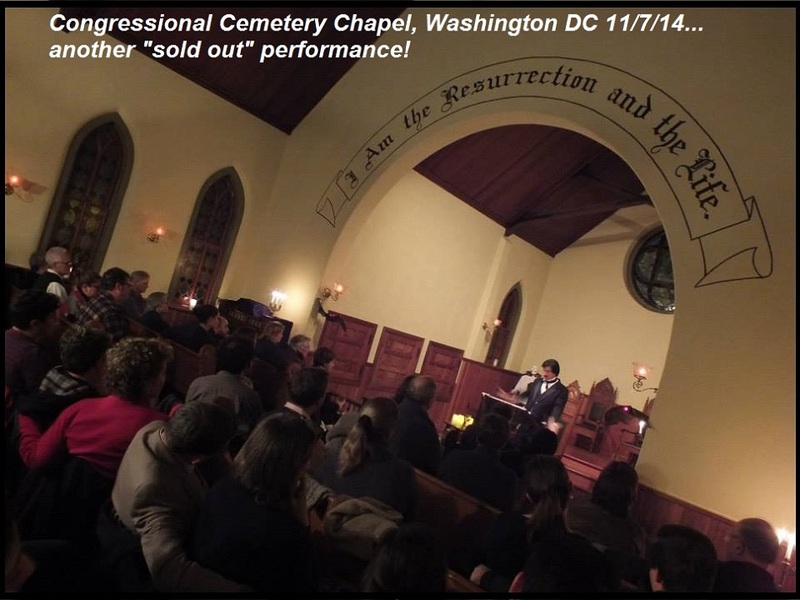 This historical landmark and gothic-style church is one of the most important of all Poe-related locations, visited by many, many thousands of fans from around the world. 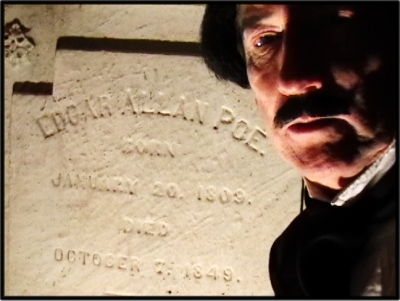 Tim Beasley as "Poe" has a quiet moment of reflection at Edgar Allan Poe's gravesite in the Westminster Burying Ground, Baltimore, MD. 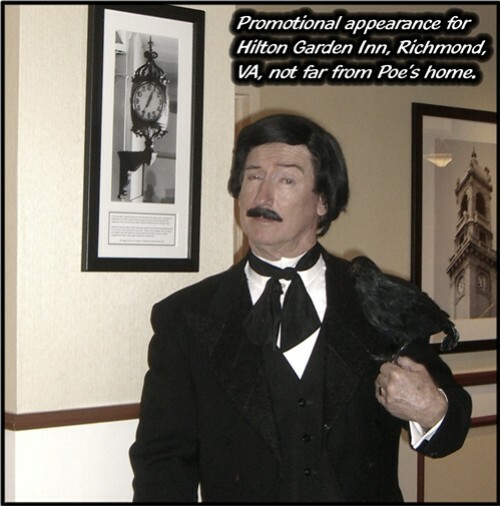 This is probably the most important landmark world-wide for any Poe fan. 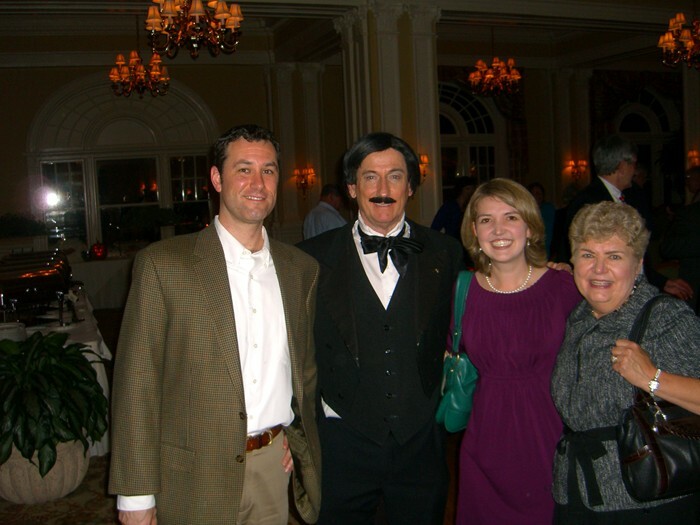 Tim Beasley as "Poe" with guests at the sold-out "An Enchanted Evening With Edgar Allan Poe" event at the historic Chamberlin in Hampton, VA. 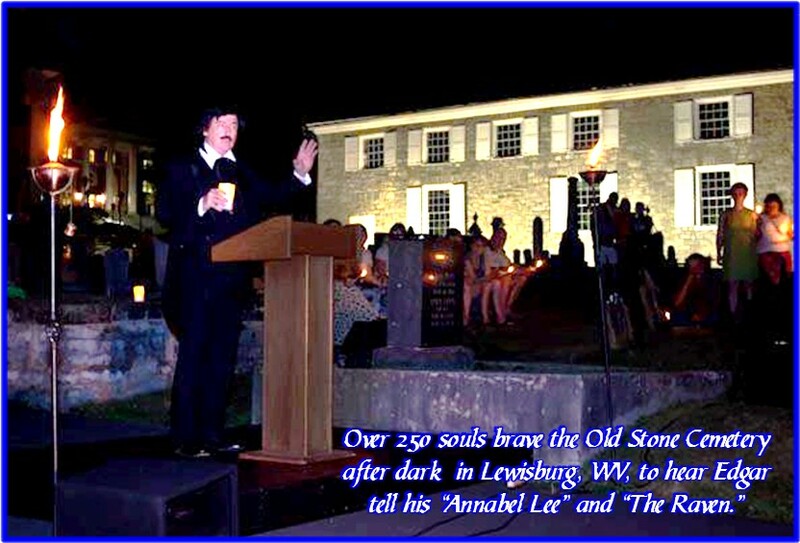 It is noted that Poe himself performed his "Annabel Lee" very near this very location in the former Hygia Hotel. 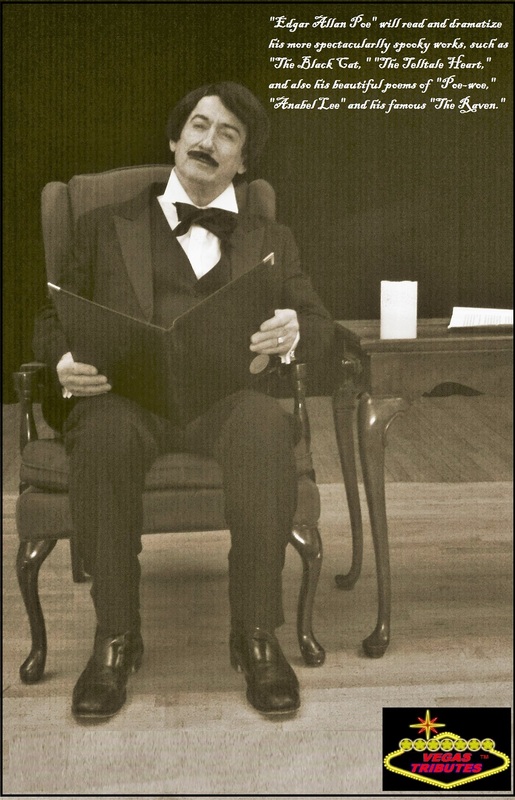 Performances nationally include those granted by The National Endowment For The Arts "Big Read Project" at high schools and libraries, promoting reading the Poe classics as a favorite American author. 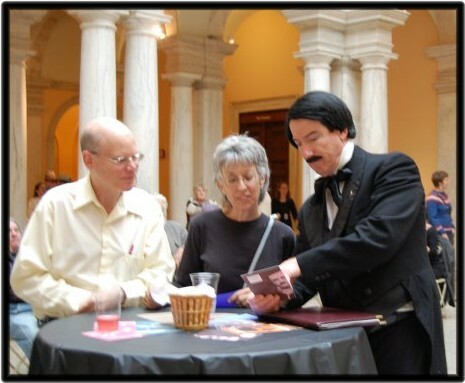 Here's other grand variety performances you may consider, such as the "Night At The Museum" socials and special events, as the one illustrated above at the prestigious Walters Fine Art Museum in Baltimore, MD, and also very popular lately as the special "Gothic Guest" for Gothic and Voodoo themed weddings!!! 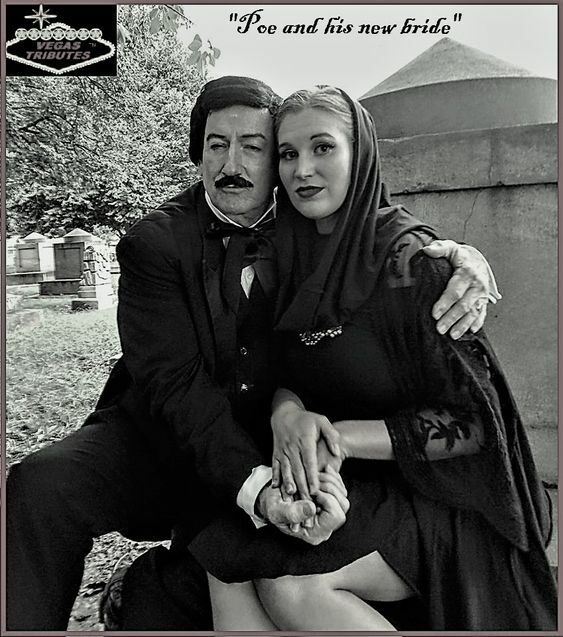 Here's a video of this grand Voodoo - Goth Wedding!!! 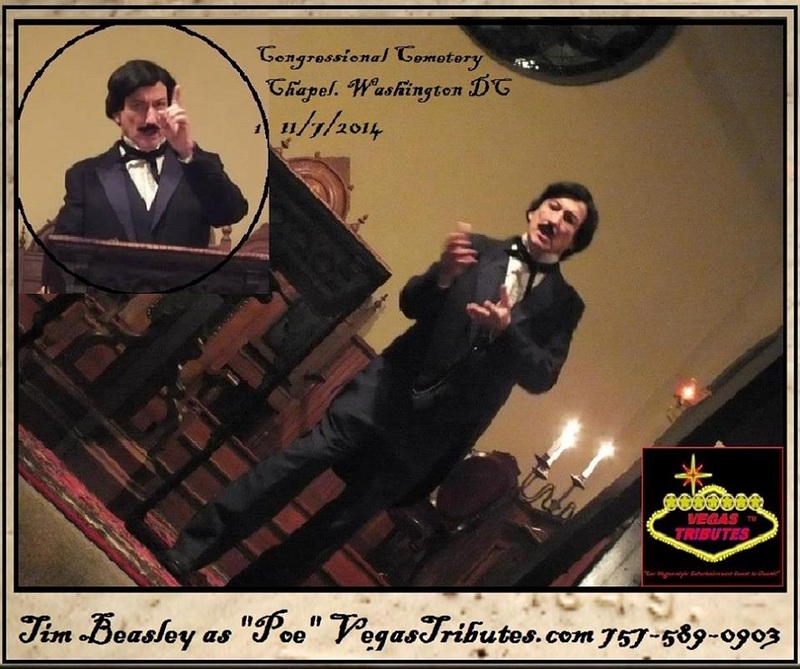 such as having his very unique "Dead Poets" dual performance as both "Edgar Allan Poe"
and legendary rock music poet "Jim Morrison," in musical concert. 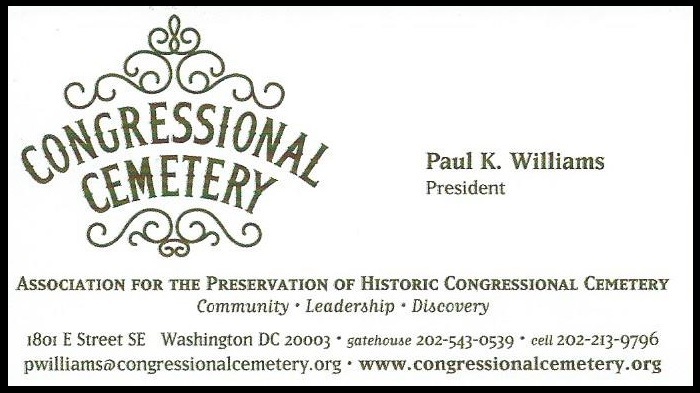 Please Call....we love to talk!.